Certificate as awarded to Hot Doug's following this nomination. Hot Doug's in one of my favorite places to eat in the world. I discovered it when my then-girlfriend/now-wife moved to Roscoe Village four years ago. It was love a first sight. A tasty sausage smorgasbord filled with all type of exotic tube steaks made from a wide variety of meats (alligator!) and given the true gourmet treatment (blue cheese crumbles with applewood smoked bacon and leeks!) I went as often as I could, particularly on Fridays and Saturdays, when Doug would offer his signature fries fried in duck fat. 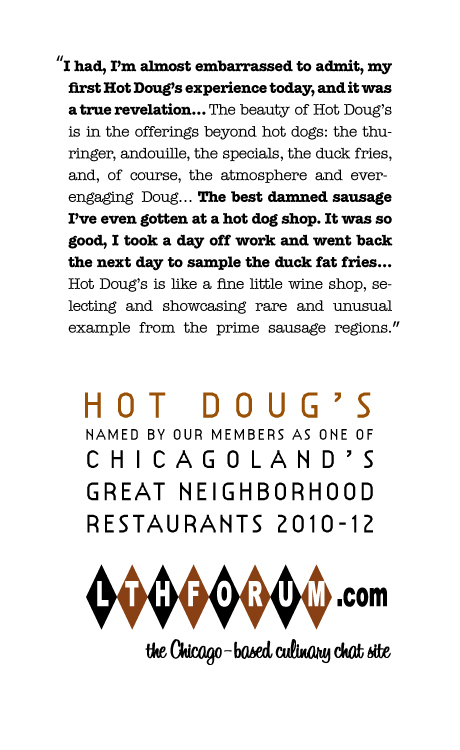 A web search on Hot Doug’s even led me to Chowhound.com and subsequently, the wonderful group of people at LTHforum. Then, tragedy struck. Hot Doug’s burned down. And for nine long months, there was a vacuum. But he ultimately reopened, staying close to the original neighborhood where he started. A trip to Hot Doug’s is special for a variety of reasons. First off, the place is amazing, filled with lots of hot dog kitsch and life sized Madonna posters. Doug stands at the front and treats everybody like they are regulars. He takes your order, offering suggestions and even refusing to sell you a larger soda size when free refills are available. He offers his usual assortment of spectacular sausages, including a Chicago Dog for just $1.50! They provide all sorts of toppings, from “salad on a bun” to sauerkraut. Specials change often and are have grown to include more of Doug’s original creations, like the Rueben on a bun or the rib-eye steak sausage. And just when you think you’ve exhausted the menu, someone finds a hidden gem, like the tater tots. Because of the amazing institution that Hot Doug’s has become and it prominent place on Roscoe, depite snow and fire, that I nominate Hot Doug’s to be one of LTHForum’s Great Neighborhood Restaurants. Thoughts from a Hot Doug’s convert. Hot Doug around the town. A note about the atmosphere. Last edited by veeral on December 3rd, 2005, 5:07 pm, edited 1 time in total. Great post (post more!). I found it quite interesting that it was your love of Hot Doug's that brought you here and not vice versa. Hot Doug's is officially seconded for the Great Neighborhood Restaurant Program (Huzzah Huzzah). You know, what amazed me in the nine months or so Doug was closed was that in a city of a million hot dog stands, not ONE made any attempt to imitate the approach that got Doug lines out the door every day. Doug demonstrates what a little imagination and willingness to, as they say in corporate America, think outside the box will accomplish. The hot dogs themselves may not be world class (wish he'd steam the buns) but other things on the main menu such as the thuringer undoubtedly are-- and the specials, the real point of distinction, are always interesting and frequently outstanding. He certainly deserves the GNR, not least for having put two neighborhoods, first Roscoe Village and now a little stretch of nowhere on California, on the map for many Chicagoans. Mike G wrote: You know, what amazed me in the nine months or so Doug was closed was that in a city of a million hot dog stands, not ONE made any attempt to imitate the approach that got Doug lines out the door every day. And it amazes me that no one is trying in another part of town today. Huey's in Andersonville puts together a nice hot dog stand with a few interesting items and a lot of personality, but it still doesn't come close to Doug's creation. Anyway, Doug's is a great place that deserves all the recognition that it gets. Great nomination. Only 3 responses for Hot Dougs?!? Guess this is another one of those sure-fire nominations...even if you've never been there, Mike G's pictures pretty much say all that needs to be said. Hot Doug's is surely GNR-worthy. An institution that continues to deliver. I support renewal for Doug and all forms of rendered fat under his roof. That's a lot of fat. It never even occurred to me to comment on this one, but yes, yes, yes, a thousand times, yes. Hello. Can you say slam dunk? Strong support for Hot Doug's GNR renewal on my part, though as a one time Celebrity Sausage I might be biased. Even though the selfish part of me hates how popular it has become, I fully support the renewal of Hot Doug's as a GNR. About a month back, I walked in to a small line at 11am, and as I was approaching the front realized I didn't have any cash. I walked up to Doug sheepishly and informed him of my situation. "No problem at all, just order now and go get money from the ATM down the street after you're done." I was blown away. This kind of positive attitude and commitment to the customer is a constant at Hot Doug's. Would I still love it if Doug was a jackass? Definitely (I'll echo the pages and pages of praise for the food), but Doug's personal touch is above all what makes this place an essential Great Neighborhood Restaurant. I also support renewal for Hot Doug's. As geno55 wrote, Doug is a wonderful guy and makes some amazing food. This place is a gem. It's a travesty that it took me so long to finally get to Hot Doug's. After several trips over the summer, I can certainly endorse Hot Doug's for renewal. not that Hot Dougs needs any further endoresement, but I think this place is great, great sausage, dedicated owner/chef. Does a place with a 47 page thread need further endorsement? Probably not, but here goes. I have had the best, most unusual, well thought out, and tastiest sausage sandwiches here, probably the best in the world. Even the char dog, while a bit high brow with its grilled onions and dijon mustard, is a standard order for me here (as a side dish of course). i definitely like this place, but all these years in i'm still off-put by the fact that sohn sources his "encased meats" rather then making them. i know, i know... there are a million great stands that serve vienna dogs, etc. but hot dougs is trying to sell a different kind of experience than the average stand. and, while it may have been cool and interesting a few years ago to offer a fois gras dog or duck fat fries, it now feels dated, banal, and even kitschy. with the whole field of cheap eats evolving (from grahamwich to mburger, etc., etc. ), it seems like this place has coasted along without pushing itself or its offerings. i would say, congrats for past wins, but let's wait until hot dougs make their own dogs.... or at least learns to challenge it's audience in a new way. sailingfanblues wrote: i definitely like this place, but all these years in i'm still off-put by the fact that sohn sources his "encased meats" rather then making them. i know, i know... there are a million great stands that serve vienna dogs, etc. but hot dougs is trying to sell a different kind of experience than the average stand. Really, what's the difference? Doug works with sausage-makers to create sausages based on his recipes and his specifications. You need him to push the button on the meat grinder and twist the casings to enjoy his products more? If he made them himself, he would basically just buy some big equipment, rent a space, and hire some labor to do the same thing that his providers are doing for him right now. He has said publicly that he will never make his own sausage. The amount of labor required to handle what he sells is huge and he'd be just as involved in the process as he is now if he owned the operation. It reminds me a bit about the famous story about the woman who met a celebrity chef and asked him "Who cooks the food in your restaurants when you're not there?". "The same people that do it when I am there." he replied. Doug is the executive chef and owner, he sets the menu and maintains his vision for his business. Making his own sausage wouldn't change a thing and would probably hurt more than it would help. To me, this is a much more compelling reason to say that Doug's may have outgrown GNR status (this was suggested with Kuma's last time), but I don't think there's reason to remove recognition at all. sailingfanblues wrote: i definitely like this place, but all these years in i'm still off-put by the fact that sohn sources his "encased meats" rather then making them. i know, i know... there are a million great stands that serve vienna dogs, etc. but hot dougs is trying to sell a different kind of experience than the average stand. and, while it may have been cool and interesting a few years ago to offer a fois gras dog or duck fat fries, it now feels dated, banal, and even kitschy. with the whole field of cheap eats evolving (from grahamwich to mburger, etc., etc. ), it seems like this place has coasted along without pushing itself or its offerings. I couldn't disagree more strongly. I guess I just don't see the difference between telling one's employees, "here's my recipe, now make these" versus telling a third-party sausage specialist, "here's my recipe, now make these". I think it's ridiculous to assert that just knowing all those sausages weren't made in that tiny back kitchen makes them less special somehow. Furthermore, I don't think a restaurant's GNR status should hinge on the fact that it's popular/well-known to out-of-towners. Does widespread success make Hot Doug's cease to be "great"? Surely not. Do the long lines somehow mean it's no longer located on an out-of-the-way corner in the Roscoe Village neighborhood? Of course not. Finally, Hot Doug's is most definitely kitschy. I'm sure Doug Sohn himself would be the first to tell you that. As for "dated" and "banal", well, I guess your standards are a lot higher than mine, those of numerous LTHers, and those of thousands & thousands of faithful regulars and sausage-seeking pilgrims. Many of us, as we stand in that long line, looking forward to chatting with the always-jovial & welcoming Sohn and sinking our teeth into some delicious, high-quality encased meats, aren't interested in being constantly challenged "in a new way"...those sausages & duck fat fries are comfort food, pure and simple. The fact that the sausages are made off-site (to Sohn's exact specifications), or that everyone & their mom has jumped onto the "highbrow versions of lowbrow food" bandwagon doesn't change the fact that Doug Sohn helped build that bandwagon, and hasn't let the quality & taste of his food (or the friendly, laidback atmosphere) slide in the least. Needless to say, I heartily support renewal. Doug dreams up how his unique sausages are dressed. A unique condiment is often made in-house. There are also considerations on how to maximize the potential of how any sausage is cooked, which he carefully to considers. Those customers he services in those six hours are intense. A friend who owned a traditional hot dog stand in the 70's could not understand how he makes money with such short hours. When I brought her over to see how his business runs, she could not get over the intensity of the operation. It is booming crowd day in and day out. When he broke his leg a few years ago on vacation, the restaurant didn't reopen until he could work. I don't think anyone has ever been there during working hours who hasn't had their order personally taken by Doug. If he isn't there, the restaurant is closed. This dedication worries me that one day he will simply say enough-is-enough and close. I happily support a GNR status. We should note that only a handful of Doug's sausages are made to his specifications (ribeye, corned beef, gyros, maybe the bacon?).. many of them are bought off the shelf, as it were. I still think the place is a fantastic restaurant for locals and tourists alike, and I'd support its' renewal. I'm not really much of a Hot Doug's fan. I'm on record as a fan of the traditional Chicago minimalist dog. I'm not into the novelty sausage experience, so I rarely go to Hot Doug's unless I'm asked to take an out of town visitor there. Having said that, I strongly support the renewal of Hot Doug's as a GNR. It is the quintessential GNR; a small neighborhood orientated mom & pop store serving food that is widely loved across all of LTHdom. This is a renewal that I fully support. As Steve and Cathy mention above, it's got all the elements that make a great GNR. I'm back from my 1st trip to Hot Doug's, complete with a bit of car dozing. I got there at 10:15 am, they opened at 10:30. There were roughly 50 people in line ahead of me. Fortunately it wasn't very cold outside. An LTH'er on Twitter (since I mentioned I was there) told me to call them about the veggie dog because they run out of it pretty fast. I called & told them I was outside & was assured there would be a veggie dog waiting for me. Here's the thing, Doug treated me like he had all the time in the world to talk to me about what I ordered & wanted. I asked him when would be best to come without a wait & he said never on Friday or Saturday. He then realized it didn't seem to matter because even during snow storms the wait could be bad. He was a perfect host. The food was very, very good. I'm glad I worked out before getting there because I was a stereotypical American ( yep I watched Jamie Oliver's Food Revolution in the wee hours), veggie hot dog, large fries, & a Coke Zero ( I can't believe I ate all of it) . Whenever sausage emporium royalty is thoughtful enough to include something, aside from the fries, for vegetarians, they get the nod. I'm already planning my next outing to Hot Doug's (it will be on a weekday) with friends and family. Now if only I can convince him to carry a veggie polish . GNR should be renewed, so what if it's no longer a hidden gem, it's certainly in a hidden neighborhood. gleam wrote: We should note that only a handful of Doug's sausages are made to his specifications (ribeye, corned beef, gyros, maybe the bacon?).. many of them are bought off the shelf, as it were. That's my understanding as well, and I do, to some extent, share the frustration with Doug for not making his own sausages, in-house (or at least in the City of Chicago), especially given that the sausage-making game in town has been upped in recent years. Having said that, as long as the lines are around the corner, and he has a lucrative business model and regular working hours, I totally understand why Doug wouldn't change a thing, or a tchotcke in the place. I have a confession: I haven't been to Hot Doug's in at least two years. How many of us who have commented actually have been to Hot Doug's over the last two years? Maybe it's just me, but I'm allergic to the lines. I know that I am in the minority view here, but I feel like the spirit that was behind giving Hot Doug's GNR is far gone and away with winds of success, the numerous TV appearances, web mentions, and tourists. Don't get me wrong, I wish Doug well, and don't begrudge his success; I fully believe that you can still get a good sausage there (even if I have not set foot in there in 2+ years), so I'm not suggesting Hot Doug's has suffered some sort of a downslide. But, I just don't think it fits in anymore. Maybe it's time for the GNRs to give Hot Doug a kiss, say goodbye, and wish him well. aschie30 wrote: How many of us who have commented actually have been to Hot Doug's over the last two years? The main Hot Doug's thread has 7 full pages of overwhelmingly positive comments from the last 2 years. If ever there were a slam dunk renewal, this is it. aschie30 wrote: How many of us who have commented actually have been to Hot Doug's over the last two years? . I have, a couple times. If Hot Dougs isnt a GNR I dont know what is. Anyway, my point is, that it's so crowded, nobody goes there anymore. of course I have (multiple times), and I've posted about it. jesteinf wrote: After several trips over the summer, I can certainly endorse Hot Doug's for renewal.